There is no denying that products like the iPhone, iPod touch and the iPad are revolutionary devices which have not only changed the way we think about consumer technology, but in a lot of aspects have also dramatically enhanced the way in which some people live their lives. The iPhone and iPod touch bring technologies such as FaceTime; which allows people to connect to their loved ones around the world via video entirely free of charge as long as they are connected to a Wi-Fi network. The iPad also features the same FaceTime capabilities, but is also about to play a pivotal role in reinventing educational standards across the United States and is used quite extensively in the medical and aviation professions to enhance professional standards. But as amazing as Apple’s products are, their success can only be defined by the company’s ability to market them. Plenty of corporations in the past have come to the market with innovative, beautiful and functional products only to find that they have total inability to market them effectively, therefore dropping off the radar. Apple makes beautiful products, but they also market them perfectly. Whether it be through perfect product placement strategies, through effective visual campaigns in their retail empire or through the simple and immediate recognizable television commercials the company manages to engage their audience and promote consumer buy-in. With that said, the release of two new thirty second long Apple commercials is the company’s next step in promoting the headline feature of the iPhone 4S – Siri. The first commercial centers around a ‘Road Trip’ and features the integration of Siri with the Maps application, location services, Yelp and also demonstrating the intelligent voice assistant’s ability to give on the fly directions to a specifically requested location. The second new commercial, shown below, focuses on a young music lover and pays particular attention to how Siri can display musical notes to help the young musician learn new abilities, as well as composing a text message from spoken words to the other band members. 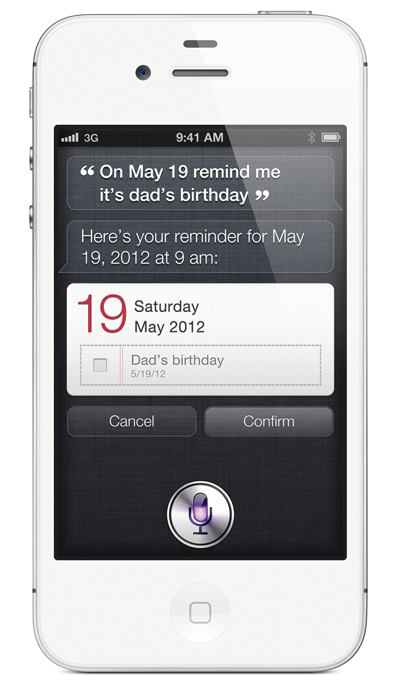 The commercial shows Siri’s use of the Wolfram-Alpha service to pull up search results, and even demonstrate the sense of humor that can programmed into Siri through the ability to specify a nickname for yourself. Both of the commercials follow the familiar pattern of being simplistic whilst focusing entirely on the product they are attempting to promote. The adverts also manage to invoke an emotional reaction as they feature real-world situations and demonstrate how the iPhone 4S, and Siri in particular, can be easily integrated into everyday life.